Shoshone is located west of Great Basin National Park, at the end of State Route 894 (see Figure 18-1). Shoshone is a rural community that lies in a long valley scattered with ranches situated one to three miles apart and includes the historic mine site of Minerva. The rural ranch community type does not lend itself to the standard community assessment procedures. Suppression resources and fuel hazard conditions are described qualitatively for the community. Nine ranches were noted during assessment of the Shoshone community. The historic site of Minerva has several old, weathered buildings that could be damaged or destroyed by wildfire. Shoshone receives fire protection from the Baker Volunteer Fire Department with additional resources available from the Bureau of Land Management Ely Field Office, the Nevada Division of Forestry Ely Conservation Camp, and the Great Basin National Park Fire Department as described in Section 4.1.1. Table 18-1 details the types of wildfire resources, cooperating partners, and equipment available to Shoshone to a reported wildfire. 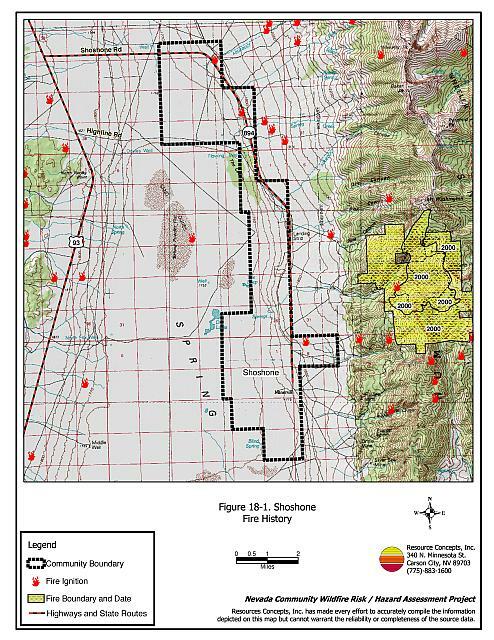 Source: Bill Dunn, BLM Ely Field Office Fire Planner; Kevin Hall, NDF Northern Region FMO. The only sources of water for fire protection in Shoshone are wells and ranch ponds. There are no hydrants or water tanks of any notable size in the area. Agricultural fields surround most of the residences in the Shoshone community. The terrain in Shoshone is generally flat and predominant winds are from the west/southwest. Wildland fuels adjacent to the agricultural areas consist primarily of big sagebrush, greasewood, and rabbitbrush. Cheatgrass and other annual grasses dominate the understory. Overall vegetative fuel loading was estimated at two to four tons per acre. Some stands of pinyon-juniper are present on the west side of the valley. Fuel loads in the pinyon and juniper dominated areas were estimated at six tons per acre. Fuel hazards were considered high on the west side of the community and moderate or low in the rest of the community. During the summer, thunderstorms produce dry lightning, which is a typical cause of wildfire ignitions in White Pine County. In years of higher than normal precipitation, cheatgrass production increases, leaving a dense fine fuel understory that will feed a wildfire ignition into the shrub layer. A dry lightning fire ignition on the east, west, or south side of Shoshone could rapidly spread through the wildland fuels if driven by erratic winds greater than twenty miles per hour. Any ranch improvements such as fences, equipment, and stockpiled hay are at risk of damage or loss. There is a low potential for structure loss because agricultural buffer zones surround most of the homes. Despite the reduced risk of damage or loss to structural properties that are protected by irrigated agricultural lands, residences in Shoshone exhibit unique conditions because of their remote location. Hay and alfalfa fields, stockpiled bales, livestock, ranching and farming equipment, and fuel tanks are assets that require special protection because of their considerable value to ranchers and farmers. Not only can stockpiled hay combust or ignite easily, but smoke can make the hay unpalatable and unusable for livestock feed. Defensible space treatments are an essential first line of defense for residential structures. Significantly reducing or removing vegetation within a prescribed distance from structures (30 feet to 200 feet depending upon slope and vegetative fuel type) reduces fire intensity and improves firefighter and homeowner chances for successfully defending a structure against an oncoming wildfire. Lean: There are only small amounts of flammable vegetation. Clean: There is no accumulation of dead vegetation or other flammable debris. Green: Existing plants are healthy and green during the fire season. Immediately remove cleared vegetation to an approved disposal site. This material dries quickly and poses a fire risk if left on site. Refer to the Defensible Space fact sheet in Appendix E for clearance guidelines. Keep the area beneath unenclosed porches and decks free of accumulated vegetation or other flammable debris. Enclose these areas wherever possible. Store woodpiles at least thirty feet from any structure. Maintain a space clear of accumulated vegetation and combustible materials for at least ten feet around propane and fuel tanks. Cheatgrass or other annual grasses that have become dominant within the defensible space zone should be mowed or treated with an application of pre-emergent herbicide prior to seed set. Treatments may need to be repeated the following year to ensure that the seed bank of unwanted grasses has been depleted. Refer to Appendix E for approved seed mixes and planting guidelines that can be used in conjunction with removal of this annual grass. Remove brush growing within thirty feet and mow grass within ten feet of fences in the community. Install spark arrestors on chimneys. Create a firebreak of bare ground or gravel for 100 feet around stockpiled commodities. Because it is dried plant material, stacked or baled hay is vulnerable to ignitions from internal combustion or from outside sources. Plant a seed mixture of fire-resistant species around residential structures and ranch outbuildings. Purchase a backup power system for properties on individual wells in the case of loss of commercial power during a large, wildland fire. Remove or board up any abandoned trailers or other structures to prevent flying embers from entering and igniting these structures. Fuel reduction treatments are applied on a larger scale than defensible space treatments. By permanently changing the fuel structure over large blocks of land to one of lower volume or reduced flammability (a fuel reduction treatment), the expected result in the event of a catastrophic wildfire would be one of reduced capacity for uncontrolled spread through the treatment area. Reducing vegetation along roadways and driveways could reduce the likelihood of wildfire spreading across roads and improves firefighter access and safety for protecting homes. Reduce vegetation by mowing to a height of not more than four inches for a distance of 25 feet from the edge of the pavement along both sides of state and county roads. Seed or treat the cleared areas as necessary to control cheatgrass. Power line corridors and transformer sites should be kept clear of flammable vegetation, as fires have been known to start from arcing power lines during windy conditions. Fire damage to power lines often creates power failures that can be especially dangerous in communities without a backup energy source. Energized power lines can also fall during a wildfire creating additional hazards for citizens and firefighters. Maintain utility right-of-ways by removing trees from beneath power lines and thinning shrubs a minimum of fifteen feet around power line transformers. Adequate training, equipment, and water drafting supplies are critical to all firefighters, whether they are first responders, volunteer fire department personnel, or agency personnel. These matters are also of special importance to all communities, especially those located in remote portions of the county. The following recommendations related to actions homeowners and the county can take to increase the quality of fire suppression response in the Shoshone community. Purchase and station a pick-up truck and a one-piece, slip-on, 100 to 200-gallon tank and pump unit with hose and hose reel in Shoshone during the fire season. This equipment, fitted properly for the size and weight limitations of the truck, can be used to provide initial attack of small ignitions. Identify agricultural wells that can be used for filling water tenders and engines, and pursue grant funding to develop water storage (at least one, 10,000 to 15,000-gallon tank) for fire protection. Agricultural wells require fire department threads for filling water tenders and engines. Identify a minimum of four people from Shoshone who would likely be able to provide the initial response to a nearby ignition. Coordinate with the Bureau of Land Management to provide them with Basic Wildland Firefighter Training. Meet annually with Shoshone ranchers and local property owners to discuss wildland fire pre-attack plans. Organize a group of volunteer firefighters and obtain wildland and structure firefighting training for initial attack of ignitions. Distribute copies of the current “Living With Fire” publication. This publication is available free of charge from the University of Nevada Cooperative Extension. Request the University of Nevada Cooperative Extension to develop a “Living With Fire” type publication tailored to the concerns of rural Nevada ranchers. The publication should include solutions for power back up, foaming systems, fire resistant seeding, and ranch site layout suggestions. Property Owners Defensible Space Treatments Remove, reduce, and replace vegetation around homes, stockpiled hay, and equipment storage areas according to the guidelines in Appendix E.
Maintain defensible space as needed to keep the space lean, clean, and green. Fire Suppression Resources Coordinate with NDF to identify four residents willing to obtain wildland firefighting training. Nevada Division of Forestry Community Coordination Distribute copies of the current “Living With Fire” publication. Work with UNCE to develop a “Living With Fire” publication for rural ranch communities. Fire Suppression Resources Identify a minimum of four people from Shoshone who could be trained to provide the initial suppression response to a nearby ignition. Bureau of Land Management Fire Suppression Resources Meet annually with local residents to discuss wildland fire pre-attack plans. White Pine County Fire Suppression Resources Purchase and station a pick-up truck and a one-piece, slip-on, 100 to 200-gallon tank and pump unit with hose and hose reel in Shoshone during the fire season. Identify agricultural wells that can be used for filling water tenders and engines and develop water storage (at least one, 10,000 to 15,000-gallon tank) for fire protection. White Pine County Fuel Reduction Treatment Reduce vegetation within 25 feet from edge of pavement on both sides of roads. Utility Company Fuel Reduction Treatments Remove trees and thin shrubs beneath power lines and utility poles. Maintain a minimum of fifteen feet of clearance around power line transformers.